Ka sales are beneftting from scrappage bonuses. Ford of Europe's first-half new-car sales fell 16.3 percent amid a weak market, the carmaker said on Monday. One bright spot was a 1.6 percent sales increase in Ford's main 19 European markets in June, the first year-on-year monthly increase since December. Ingvar Sviggum, Ford of Europe's head of marketing, sales and service, said: "While June was a more positive month, we're still a long way from a sustained and healthy market." Sviggum said the weak underlying market across Europe would be in a far worse condition without scrappage schemes, which are boosting sales in key countries such as Germany, the U.K., Italy and Spain. The lack of access to affordable credit and fears over rising employment "continue to be huge hurdles to the market demand for new vehicles," he added. Sviggum called on European government to extend or even expand scrappage schemes, which offer buyers incentives to swap older cars for new models, until the European industry picks up, probably in the middle of next year. France is considering a gradual phase out of scrapping bonuses and Germany does not plan to extend its scrapping plan into 2010. Ford's first-half sales were down by 163,700 units to 840,400 in its 51 European markets, which include Russia and Turkey. Six-month sales dropped by 90,200 or 11 percent to 733,300 in its 19 main European markets, which are mostly in western Europe. June sales were down 8.8 percent to 160,000 in the 51 markets and were up 1.6 percent or 2,300 units to 142,700 in the 19 main markets. 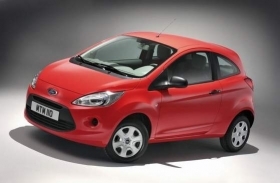 Sales of Fords small- and minicar range are benefiting most from scrappage bonuses. In the first six months, more Fiestas were sold than in all of 2008. About 45 percent of all Fiestas sold were high series models, Ford said. In June, 43,700 Fiestas were sold in Europe, 13,100 more than of the previous-generation Fiesta in June 2008. Ford sold 9,800 units of the new Ka minicar last month, 4,100 more than in June last year. The U.K. was Fords biggest European market and No. 2 global market in June with sales of 36,000 units, down 1,200 from the same month in 2008. The U.K.s newly introduced scrappage scheme added 12,000 sales to the monthly figure, Ford said. In Germany, Fords sales were up 6,800 units to 30,800. French sales grew by 600 to 16,300 while Italian sales increased by 3,900 units to 20,600, helping Ford to keep its position as the countrys top import brand.